From the moment you enter the Cooper Young Historic District under the art railroad trestle, ginkgo lined Cooper Street greets you. 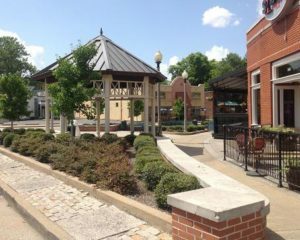 Welcome to the “hippest” neighborhood in midtown Memphis. Quaint homes, restaurants, bars, small retail shops, businesses, and a brewery await you. The Cooper Young Historic District comprises almost 60 blocks and is home to over 8,000 residents. The majority of homes were developed from the 1890’s to 1940’s. Queen Ann, Victorian, Foursquare, Colonial Cottage, and Craftsman Bungalows all represent the diversity of home styles in this charming neighborhood. The Cooper Young Arboretum project was created by the Cooper Young Garden Club to encourage community involvement within our own urban forest. 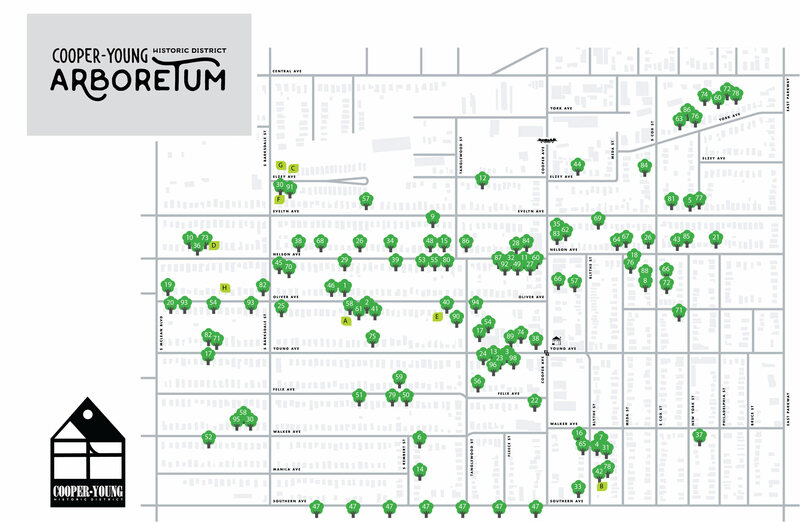 Our arboretum encompasses trees located in the front yards of homes, the Spanish American War Park, local businesses, and schools within our neighborhood. Our plan was to bring this arboretum to our neighborhood streets where residents and visitors walk, exercise, shop, dine, and socialize. Our desire is to add to our already magnificent canopy of trees, beautify our neighborhood, improve our air quality, and teach our children to love the beauty of nature. We are living in a tree museum. The Cooper Young Arboretum is supported by the Cooper Young Garden Club and the Cooper Young Community Association. Residents and businesses have agreed to maintain and care for their trees listed in the arboretum. The Cooper Young Garden Club sponsors a yearly tree fund reimbursement program to add to our neighborhood canopy of trees and additional tree species. Additional information about this program is provided at the end of this website. The Cooper Young Arboretum is free and open to the public daily. Pamphlets with a map may be found at the Cooper Young Community Association office at 2298 Young Avenue or viewed online at www.cooperyoung.org. Information about the Cooper Young Historic District may be found at the following websites. The gazebo surrounded by ginkgo trees at the intersection of Cooper Street and Young Avenue. Tours may be self-guided with the map or free tours of the neighborhood arboretum can be arranged by calling the Cooper Young Community Association office at 901-272-2922. For help on the walking tour, look for stenciled leaves on the sidewalk. The leaves will match you to the specific tree. Tours will be conducted by members of the Cooper Young Garden Club. Visitors to the arboretum can expect to see a wide variety of trees. We have huge very old trees to those newly planted to view. We have a diverse number of Conifers, Magnolias, Oaks, and Maples. The Spanish American War Park has a vast array of shrubs and trees to view. We have also included smaller trees/shrubs with mature growth less than 15 feet for added interest. reimburse for two trees a year in our neighborhood. The program will be on a first come, first served basis. The CYGC will reimburse for half of the cost of the tree, not to exceed $100.00. You must meet the following conditions to apply for the tree reimbursement program. 1. You must live in the Cooper Young neighborhood. 2. Choose a tree from the list of appropriate trees and plant in the front yard. 3. Provide a receipt to the GYGC. In creating this arboretum, we also added educational websites for our neighborhood schools and for those students who are home-schooled. www.arborday.org How to plant and care for trees.